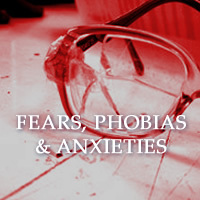 Do You Suffer From Phobias or Any Other Negative Emotional Issues, And Are Desperate To Try And Find A Way To Begin Letting Go Of Those Problems That Are Holding YOU Back From Enjoying Your Life? We’ve all felt intense emotions during our journey through Life, but do You suffer from overwhelming emotions that negatively impact on your day to day existence? At times, it may feel like you’re “just existing” in a state of unnecessary pain, caused by the thoughts and feelings you carry around with you… Outwardly, you wear that false smile, tell everyone “I’m okay” but inside, you find yourself dreading each day, gritting your teeth and hoping that maybe tomorrow things will get better. Or maybe you have a Phobia that impacts what you can and can’t do (as well as your loved ones)? How Would It Be, If Your Life Could Be Better Than It Is, Right Now? You may or may not believe me when I say this but, whatever overwhelming negative emotions you’re experiencing right now, can be dealt with and easily resolved… IF you make the decision and choose to begin letting go of that emotional baggage. As a qualified NLP Master Practitioner & Conversational Therapist (based in Brighton, East Sussex, UK), I’m here to let you know that you needn’t suffer in silence. Positive Change for You is Possible! Like many people, I doubt you’d feel convinced by what I or anyone else suggesting you seek treatment would have to say. I understand, because I’ve also been there. So instead, why not read what others have to say and how much they’ve benefitted from working with me? My first introduction to Zain was via the phone. I was in a terrible state of depression and very suicidal. I had experienced several major bereavements and a relationship break up and I had got to a point in my life where I couldn’t breath or think straight. I just couldn’t cope or function normally. Have a look around this site and, when you’re ready, use the handy contact form to get in touch – even if it’s just to ask a question, before you make up your mind to begin letting go of your issue!